An integrated management system of ABB i-bus® KNX – system installed in smart apartment in residential building “Panorama Sofia”. The system allows integrated control to all installations and interoperability of their functions. The ABB i-bus® KNX system is extremely flexible and allows the operation changes at home to get through reprogramming, where the only limit is the fantasy of the owner and the system integrator. 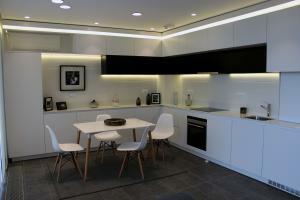 Lighting and blinds – modern energy efficient LED lights. An option for individual control (on/off/dimming) to each not only helps to reduce the energy consumption but also allows to make the suitable light atmosphere for any situation. The ability to control different light scenes will allow the future residents by pressing a single button to reproduce preliminary saved scene combining blinds and lighting. The lighting in common areas (corridor, bathroom and dressing room) is controlled by presence detectors additionally reducing the power consumption. The blinders can be controlled by predefined timetable and can be used when creating different light scenes. For example, by lighting and blinds can be performed a presence simulation while owners are on their annual leave. Safety functions – there are combined detectors in each premise that will alert in the event of smoke appearance. Gas detectors will suspend the of gas flow in case of gas leakage. Flood detectors will submit an immediate command to the shut-off valve of the vertical pipeline in case of water leakage, preventing from subsequent damages. Central functions – the possibility that the owners can have an overview of separate systems and to perform control at their home through a mobile device (smartphone or tablet). Through the device can be controlled the blinders and the lighting in each premise, change of heating settings, control and change of the air conditioning settings where no physical presence into the apartment is required. The owner will be notified on the mobile device in case of alarm activation as well as unexpected guests by intercom live video of the entrance door. Another central function is the Gentral On/Off function which allows upon leaving the apartment and pushing a single button to turn the lights off, lower the blinds, switch the heating into eco mode and power down the non-important consumptions. When entering at home the normal system settings will be restored. ABB i-bus® KNX is applicable for both residential and public buildings. ABB (www.abb.com) is a leader in power and automation technologies for the needs of the electricity grid and industry. The ABB Group of companies operates in roughly 100 countries and employs about 140 000 people. 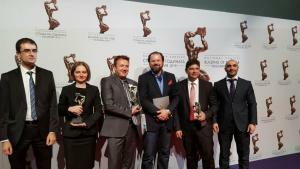 “ABB’s building automation technologies provide energy efficient solutions and I am very glad to see this intelligent control system, along with our proven low-voltage products implemented in such a modern residential edifice”, said Ekkehard Neureither, Country Managing Director for ABB in Bulgaria. The Investor of “Panorama Sofia” is “Residential Park Sofia” EOOD, a subsidiary of Lindner Vermögensverwaltung GmbH, a company of the Lindner Group Germany. Lindner AG operates worldwide with over 30 subsidiaries in Europe and Asia, and a total of 5500 employees. 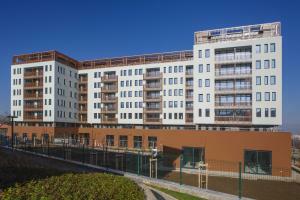 “We are very satisfied with the low-voltage products and control systems provided to “Panorama Sofia”. The ABB i-bus® KNX is very attractive to our customers due to its modern design, secured background and easy to use interface.” said Mr. Georgi Ranchev, General Manager of “Residential Park Sofia” EOOD.